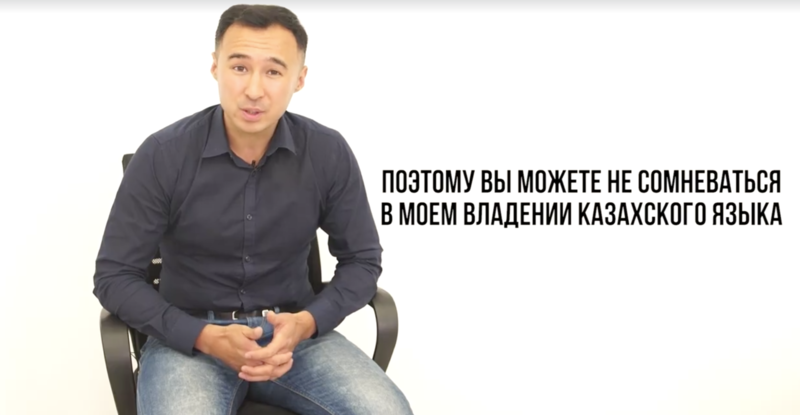 A famous actor and entertainment producer in Kazakhstan has waded into a recurrent controversy about language after appearing to endorse the view that it is not always necessary to know Kazakh. The outcry began when Anuar Nurpeisov posted a video on his Facebook account in which he discussed his recent visit to Singapore and how he was struck there by how many people he heard speaking English. Why, he wondered, could people not be as relaxed in Kazakhstan toward those, including ethnic Kazakhs, that prefer to speak in some other language? The remarks drew heated criticism online, where champions of the Kazakh language condemned Nurpeisov for frequently speaking in Russian — instead of his native Kazakh — in his television appearances and elsewhere. Society in Kazakhstan was split over decades of imperial Russian and then Soviet rule into two linguistic camps. Typically, urban Kazakhs were forced to rely on Russian as their main language of communication and many continue to do so to this day. By the estimates of a researcher with the Institute of Ethnography at the Academy of Sciences of the Soviet Union, Olga Naumova, around 40 percent of Kazakhs no longer spoke their own language by the late 1980s. Naumova found that nearly three-quarters of Kazakhs living in cities did not use their native languages. The editor Qazaq Uni newspaper, Kazybek Isa, said Nurpeisov had missed the point in his Facebook complaints. “He cannot understand that 1.5 billion Chinese people are not at risk of losing the language in which they speak. But the Kazakh language has over the 25 years since we gained independence not yet become a full-fledged state language,” Isa wrote. Following these kinds of attacks, Nurpeisov filmed another video hitting back at this detractors arguing that he was entitled to speak any language he liked. The clip is recorded in Kazakh but provided with accompanying Russian subtitles. As Nurpeisov explained, he studied to distinction in a Kazakh-language school for gifted children. When he sat his Kazakh language exam he got 26 marks out of 30 and received a scholarship, Nurpeisov said, noting that his critics did not need worry themselves about his fluency in Kazakh.